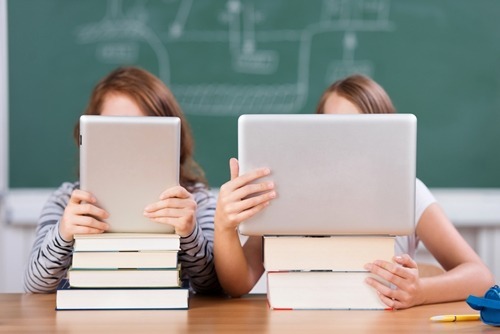 The rapid growth in technology, particularly tablets and smartphones, has also carried with it numerous new applications for technology in the classroom. This emerging trend of schools investing in more digital infrastructure for students was most recently exemplified by a report from the Boulder-based Daily Camera, which reported on the proliferation of technology in local Colorado districts. The publication reported the St. Vrain Valley School District distributed around 6,200 iPad minis throughout all the middle schools in the district at the start of the school year. The district is able to make use of $2.2 million allocated to it for providing devices to students. The Daily Camera said the St. Vrain plan to move ahead with one-to-one technology programs follows the example of Monarch High School in Louisville, part of the Boulder Valley School District, which is in its fourth year of having students use devices provided for classroom purposes. "This is huge for our kids," Liz Sims, Trail Ridge Middle School science teacher, part of the St. Vrain district, told the source. "The digital divide just gets bigger and bigger when one kid is on a computer all night and one kid gets 30 minutes on a computer in school. This is such an equalizer." However, one note of concern raised by parents and school officials alike is the potential for damage that comes with equipping hundreds of children with expensive, and sometimes easily damaged, tablets or laptops. To protect against such occurrences, the district is offering case and screen protectors, as well as insurance. The source also reported the district would allow individual teachers to formulate their own policies on usage. Susan Ferdon of Deerfield Public Schools in Illinois recently wrote about teachers stipulating their own one-to-one policies and mentioned that protecting against damage is a critical point.